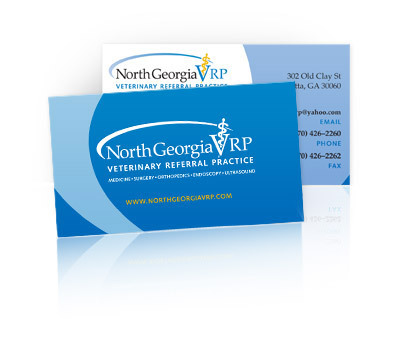 Your veterinary hospital's business card speaks volumes about you and your veterinary practice. With minimal costs and high benefits, this simple tool can perform an important PR function that will pique the interest of future clients. Even in the digital age, a well-designed veterinary business card remains an incredibly important component of any veterinary hospital's branding and marketing toolkit. According to John Williams of “Entrepreneur” magazine, business cards play a key role in forming a potential client's first impression. A business card reveals not only how much pride you take in your profession and your work, but may also communicate the benefits of your hospital – all in a matter of seconds. This first impression then turns into lasting impression each time a client or pet owner sees your card. It's important to understand what your veterinary business card is capable of saying about you and your practice, and how you can best display this in a three-inch paper platform. Knowing precisely what to communicate, and the methods of best displaying it, however, is no easy task. The design and marketing team at VetNetwork understands your needs and knows precisely what to communicate and the most effective way of displaying it. As a veterinarian and business owner, you understand that paying attention to small details is what separates successful practices from unsuccessful practices. A smiling face at the front reception desk, a warm greeting from the veterinarian, and a clean waiting room all contribute to making a good impression on clients. Custom veterinary business cards and stationery are an important way to leave a lasting mark on pet owners and business associates. Call VetNetwork today at 800-564-4215 or contact us here for veterinary hospital business cards and stationery that separate your practice from all the others.